Gavin about to visit Glengoyne Distillery. 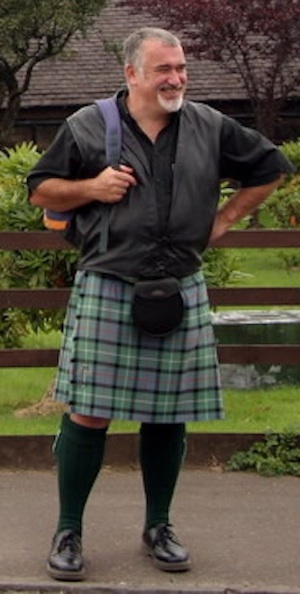 Hello, my name is Gavin Hunter, a professionally qualified Blue Badge member of the Scottish Tourist Guides Association (STGA). If you are thinking of coming to Scotland, let me help be a part of your experience of the wonderful country of Scotland. Your destinations could be any of the many exciting, beautiful, intriguing and wild places we have to offer visitors to our shores. I am available as a tourist guide throughout Scotland working with all sizes of groups - from the largest corporate groups to the smallest group of independent tourism visitors. I specialise in French, German and English language tours. For small groups, I can also help you plan and organize your visit. Visit vibrant and bustling cities such as Glasgow, Edinburgh, Stirling or Inverness with their architecture, restaurants, pubs, castles and shopping! Travel far and wide or keep it local. Travel to the wild Highlands of Scotland to the extreme north and the breathtaking grandeur of Torridon or Sutherland. Have a day or two travelling through the beautiful scenery of Perthshire, sampling beers, smoked salmon and farm produce as you go. What about a tour from Edinburgh to Stirling Castle and the Trossachs (the area where the real Rob Roy, made famous by Sir Walter Scott, plied his trade as cattle thief!)? On the way to Stirling why not visit the Bannockburn Visitor Centre which celebrates the famous Scots victory against the English 700 years ago in 1314? Perhaps a whisky tasting tour of the world famous Speyside area combined with a visit to sheep dog demonstrations or a trip on a steam train evoking past glories of the steam age? Travel further east to Aberdeenshire and visit many of the castles and fortified houses on the Castles Trail or focus on royalty in Royal Deeside and Balmoral Castle. In the evening stay in one of the many delightful bed and breakfasts or a former hunting lodge and sit by the fire sampling the local 'dram' (measure of whisky). Spend a day (or more) in the delightful region of Fife with its palaces, castles, fishing villages and medieval towns. One such is St Andrews, seat of Scotland's oldest university, which celebrated its 600th anniversary in 2013. Eat beautifully fresh fish, shellfish and game from the shores and moors of the local area. Eat à la carte as you gaze from your restaurant out onto the beach in St Andrews where Chariots of Fire was filmed. Or enjoy fish and chips from a newspaper finished off with an ice cream as you walk round Anstruther harbour! “ Dear Gavin, Thank you for making our trip around Scotland so special. You are a great representative of Scotland with an incredible resource of knowledge. Thank you so much. We all loved our sailing and you contributed to that". Sheila, Richard, Ken and Mark.